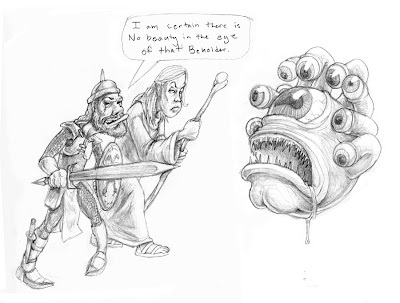 Bahlorg uttered these words shortly before he was vaporized by the Beholder. I have not played Dungeons and Dragons for 15 years but I recently came upon a buddies blog that is dedicated to the drawing of D & D mishaps. This is a sketch inspired by their shenanigans. hahha, classic! DnD friggin rules. I honestly think it hones story and improvisation skills. Some of my favorite characters of all-time come from RPG campaigns with friends. This is very funny and, of course, a beautiful drawing. good job. I just lose a hit point. Aww cool! Those are some fierce warriors to take on that creature! This is a beautiful drawing with fierce-looking characters. i only 'get' this cuz my hubby is a nerd. but nice job! Dang! I would not go near that fierce-looking thing.